Once news broke that the FBI launched their own investigation into whether Trump is a Russian agent, the President was outraged. And yet mainstream news outlets pushed the FBI’s claim that Trump may be on Russia’s payroll. Then, Virginia’s two Democrat Senators took to the cameras to push the Trump-Russia narrative even further. President Donald Trump opened fire on the FBI this weekend after the New York Times reported that the agency launched an investigation into whether he was acting on behalf of Russia after firing former FBI Director James Comey. The President dismissed these claims as disgusting. The FBI investigation is just the latest in a series of allegations and investigations directed against President Trump, usually conducted by disaffected Democrats who remain bitter about his 2016 victory. Kaine supported this claim by mentioning Trump’s post-campaign communications with the Russian government. Kaine was then asked whether the FBI overreacted by investigating Trump on these charges. “I flip the question around,” Kaine answered, then he attempted to shift the topic towards protecting the Mueller investigation. Virginia’s other Democratic Senator, Mark Warner, also skirted the issue. “When asked about those reports and whether he believed Russia had outside influence on White House operations, Sen. Mark Warner, D-VA., hedged, opting to highlight the recent revelations that Trump campaign manager Paul Manafort shared polling data with a Ukranian consultant with potential ties to Russian intelligence,” the Washington Examiner reports. Then on CNN, Warner explained “[i]t would be that kind of information that would inform the Russians later in the campaign when they launched their social media efforts,” describing Paul Manfort’s polling data. It appears Virginia’s top Democrats still consider that President Trump may be working under Russian orders. Comey since endorsed multiple Democrats in the 2018 elections and even donated thousands of dollars to Democratic candidates challenging close Trump allies in Congress. Trump has also pointed out that his actions against Russia have been far tougher than Obama’s tenure in office. The audacity of the FBI to investigate whether the sitting President of the United States was a Russian operative has conservatives outraged. But the issue goes far deeper than originally thought. No leaders in the executive branch authorized this investigation. And yet the FBI is supposed to answer to the President of the United States. This was all conducted entirely on their own initiative. And the FBI has yet to reveal the details of this investigation. It’s unknown who authorized it or who worked on it. These facts matter to the American people and conservatives are demanding the President get to the bottom of this. Should President Trump demand more information from the FBI about their investigation? These two asswipes need to shut the hell up . They have done nothing for Virginia except take our money. I wrote to them once got the same form letter from both offices. At least when I wrote to Dave Brat he ansered me and explained his thinking. Never again will I communicate with either of them. These two so called senators have been tied in with crooked hillary all their lives have never done anything good for Virginia. They should be jailed with hillary. These two Dems do not represent true Virginians. They are just part of The Dismal Swamp! These two are Russian spies and traitors to America got no use for either one . These two arses are worthless will try n get them both out when time comes, plus the fact they know the truth but won’t admit it. They both signed everything that the USURPER signed and they were kissing his arse ever time he bent over. Want to see a pair of Virginia dumocrap idiots just look at the picture. Because Democrats are truly lying, criminal arrogant idiots. And only idiots would vote for them. 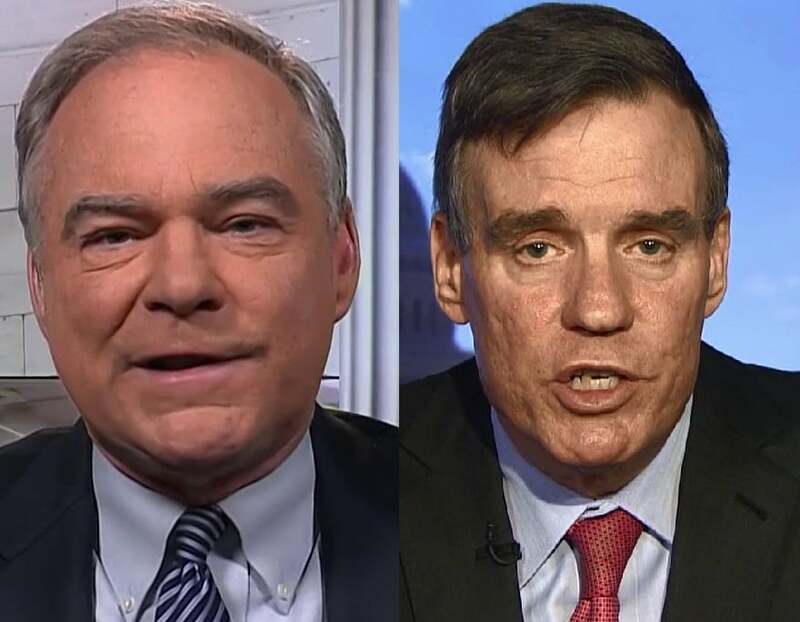 Little Timmy and Marksist Warner are good little democrat sheep. They faithfully parrot the talking points their masters tell them. They are both too stupid to think for themselves. Ever since Warner became a Senator he has been a “yes man” for Harry Reid and now Chuck Schumer. He puts a flawed ideology ahead of the country. Trump’s connections to Russians pales in comparison to the Clintons and the proven relationship between Hillary’s campaign and the Russian operatives. These two are WORSE THAN WORTHLESS! On numerous occasions I have written to them both, asking SPECIFICALLY how they intend to vote on a particular bill. EVERY TIME, I get a FORM LETTER that dances around the issue, and NOT ONCE have I ever gotten an actual answer from either of them. I once responded to Kaine’s form letter with another letter asking him AGAIN to answer my question. A few days later I got another copy of the EXACT SAME FORM LETTER he had sent me the first time. At the time Robert Hurt was our Republican Representative in the House. I had sent him a letter asking about the equivalent bill in the House. I received a response that briefly outlined his position, told me how he would be voting, and his reasons for doing so. If Kaine or Warner were ON FIRE, I wouldn’t so much as piss on them. They’re both total wastes of skin!!! Those of us in Virginia that do not live in Northern Virginia are embarrassed every time these senators go before the camera and say stupid democrat talking points. Hillary is behind it all , creating one diversion after another to cause chaos and plant doubt amongst the American people but it’s all a lie. She and her party are nothing but Socialists, Rats,,Theives, liers, idiots,….. And then some!! Our President has done more good than any President since ever. And he will continue to. There are more people that believe in him than the lying media is admitting. I have Faith in him. Period. i MOVE WE IMPEACH SEN. KAINE FOR TRYING TO CIRCUMVENT THE LAWS OF OUR STATE AND NATION IN THE ELECTION WITH HILLARY CLINTON . GET THE EMAILS BETWEEN KAINE AND WARNER AND YOU’LL HAVE ALL THE COLLUSION YOU NEED. Morons. Denying the crow that’s coming. Don’t worry about the commies coming, they are already here. Just look at dumb and dumber.